Hi everyone. 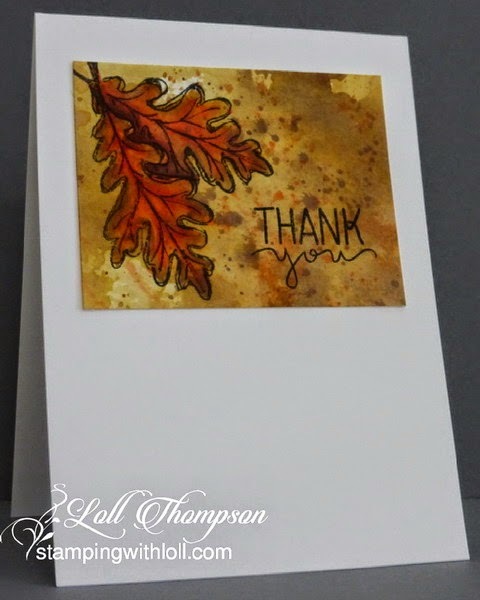 Continuing on with my watercoloured cards ... and again using the oak leaves from Gently Falling stamp set (Stampin' Up!) --- I never get tired of this stamp set! I sent this to my friend Marina a while back and she has received it, so I'm sharing with you. This is the last of the twelve thank you watercoloured cards that I made. I sent one to each of the twelve friends that were Guest Designers for my Christmas Tag event. I wanted to thank them for all their efforts to make the event so special. They are all so wonderful! what a lovely watercolored background for your beautiful leaves Loll! We were all so blessed to receive one of your gorgeous watercolor cards! Love these leaves and your watercolor background! Well, I think you definitely have the 'hang of it', Loll! Beautiful leaves, and your water colored background is so pretty! How nice of you to send Thank You cards to everyone who joined in your Christmas Tag event...so happy it was such a huge success, too!